You’ve heard of white bread, wheat bread, and maybe even cloud bread -- but what about purple bread? It might sound like something out of a Dr. Seuss book, but purple bread is already being called a superfood for its antioxidant levels and health benefits. 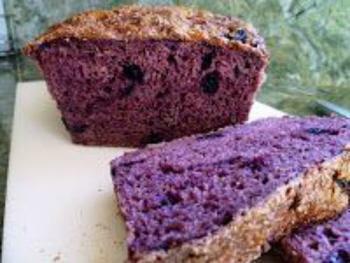 Purple bread, invented by Professor Zhou Weibiao, a food scientist at the National University of Singapore, is loaded with anthocyanins. You might know anthocyanins for their work in giving eggplants and plums their distinctive hue, or perhaps for their role in helping to slow digestion or reduce blood sugar levels. Now, anthocyanins are being baked into bread to help counteract some of regular bread’s not-so-great qualities. Zhou found that extracting anthocyanins from black rice and adding them to white bread leaves behind 80 percent of the antioxidants in the crust when baked. Furthermore, the anthocyanins’ reaction with the starch enzymes acts to slow the digestion rate by 20% -- a big triumph over regular white bread, which is digested quickly, spiking blood sugar levels in the process. "The challenge was to see if we could change the formula of bread, without changing the smooth texture of white bread that people really love," Zhou told CNN. As it turns out, it was possible. Purple bread has the texture of white bread but is digested more slowly than white bread -- the "best formula," says Zhou, for those who enjoy bread but not its effects on the body. While the purple loaves may be a bit kinder to the body than regular bread, Zhou says that doesn’t mean it’s a magical tool for weight loss. "You are eating the same amount of starch and wheat flour, so the nutritional value is the same," Zhou said. "The key idea here is slowing down the energy release, so you use those calories over a longer period of time." Purple bread is not commercially available yet, but it could be soon. Zhou says he’s already been approached by major food manufacturers about bringing it to market.